We're at it again! Today we're creating another tablescape inspiration for your holiday hosting. We stayed true to our previous table setting tips, but we took it one step further and chose a "jumping off point" for our color scheme. We wanted to create an elegant scene this time- one that really makes a statement for any occasion. To start, we found a vintage vessel with a really beautiful patina at a local consignment shop, and took it to our florists, who created a one-of-a-kind centerpiece. We are using this as the color inspiration for our setting. The arrangement has a modern and free form with a gorgeous color scheme. 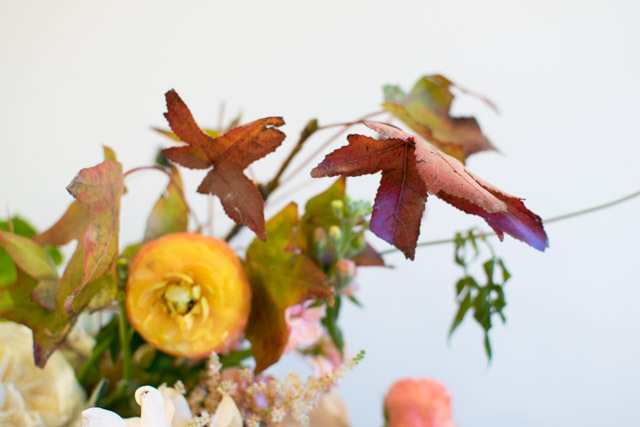 We love how the pastel pink contrasts with the rich red and purple of the autumn branches. Using the centerpiece as our jumping off point, we chose a deep emerald green table linen to lay the foundation. 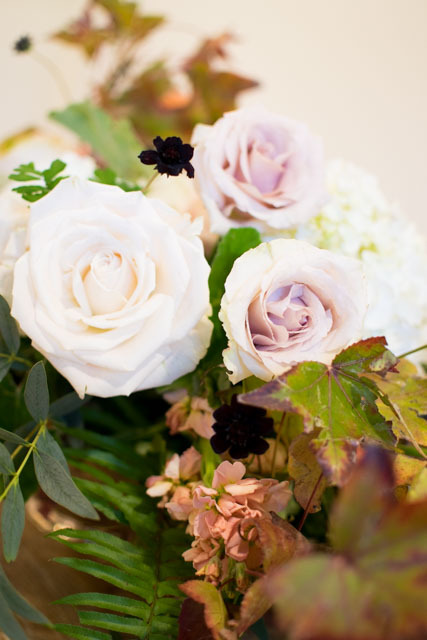 This color mimics the lush greenery and foliage used in the arrangement. Deep greens just seem to evoke an unspoken elegance, which is just what we're after! Inspired by the white Hydrangea and soft pastel colors in the arrangement, we layered white dinner plates and a natural linen napkin to the setting. Then for contrast we chose black soup bowls, which not only finish the place setting, but also echo the dark Cosmos used as accent flowers in the arrangement. Reflecting the gold tones of the Ranunculus and autumn leaves, we chose gold flatware in a sleek modern shape. This helps streamline the tablescape and plays off of the more traditional elements like the crystal glasses. Vintage gold candlesticks partnered with our vintage vessel bring that sense of timeless elegance similar to that of the roses in the centerpiece. The wooden cake stand with the pink marble top has a modern traditional feel, and the beautiful pastel tones in the marble are the perfect compliment to the soft color story being told by the Astilbe and Stock. And finally, why not use the beautiful colors of the food to help set the scene for your dinner party? That is exactly what we did here, choosing a deep burgandy beverage that really brings out the rich tone in the autumn leaves and ties our tablescape all together.